ahhhh, next. i'd hoped & wished & dreamed that you would do a vegan menu. and now, you have! so first, a big thank you to chef grant achatz of alinea & nick kokonas (co-owners), as well as executive chef dave beran ... the vegans of the world appreciate this! anyway, once i found out a vegan menu was on the table (ha), i began stalking the next facebook page for info about when tickets would go on sale. i quickly snatched up a pair and we were set to go! i hadn't been sooo excited to try a restaurant in a long time ... and when our night came around, i was practically giddy. 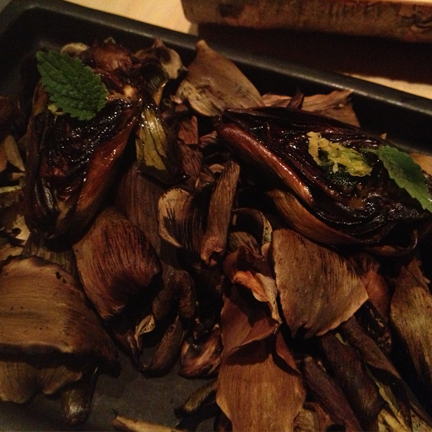 this girl loves a good artichoke. these baby bites were perfectly cooked & very tasty. 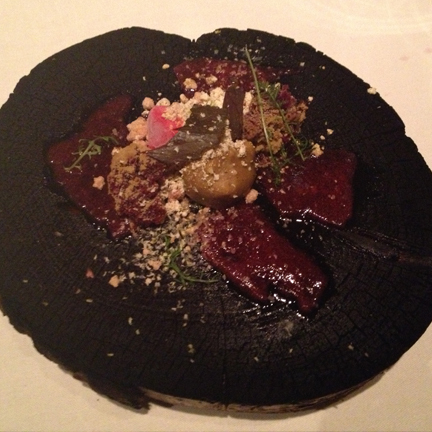 a fun plate that also came w/ a pairing of apple cider vinegar, aged in a log. the lifetime of an apple, our server told us. ah, dessert. by now, i was so full i could barely finish this. and then came yet another round of sweets! 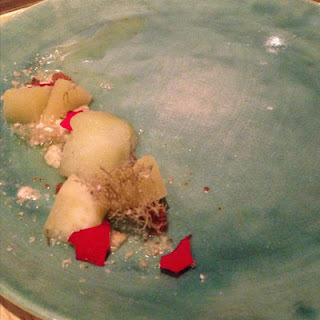 exactly the kind of dessert i'd expect here: unique. the last dessert (fantastic & moist steamed crepes) was actually my favorite, but the photo did not come out well. sorry! 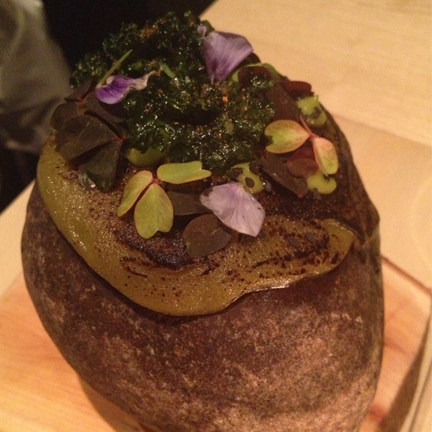 so for the most part, i loved dining at next. unfortunately, after thinking more about our meal in the coming days ... i felt that many of the dishes were only okay. they simply missed the mark. instead of showcasing how fabulous vegan food can be, some plates felt overworked and over processed. obviously, this is just my opinion, but i am an actual vegan. and the next day, i honestly felt that if i wasn't already vegan, this meal certainly would not make me consider changing my diet. and a vegan dinner at a place like next should make non-vegans feel that way. the other issue i had was the lack of cohesion. it's easy to see how the sicily or thailand menus would feature dishes that flowed together perfectly. for vegan, it wasn't as simple. 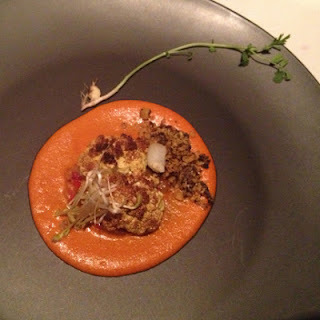 the mushroom farr-otto was separated by only one dish from the curry roasted cauliflower. for me, those two flavor profiles were just too bold & distinct to eat so closely together. 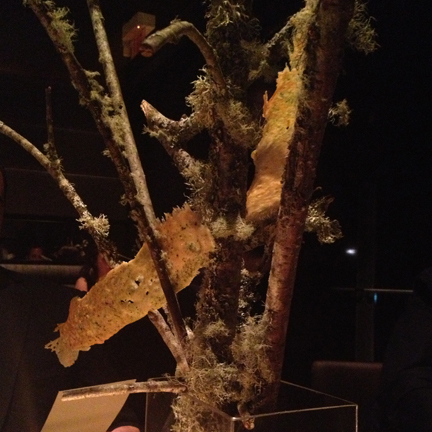 but like alinea (which i truly did love), part of the experience at next is appreciating food as art. and when you look at it that way, the entire meal was beautiful, interesting & just as important, fun. will i be back to next? probably not ... unless there is another vegan menu. which, of course, i would love to try!